Pioneers in the industry, we offer rubber oil seals from India. We are engaged in offering high quality Oil Seals. The offered oil seal is developed by employing finest quality material and latest technology in compliance to the set industrial standards. Due to its best quality, our offered oil seal earned huge value in the market. 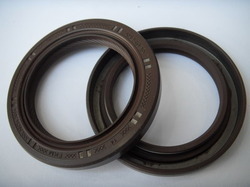 Apart from this, the offered oil seal is made provided to our customers at most competitive rates.